STOP THE PRESS!! WHATS THAT I READ??? A top LRA Commander has been captured by the UPDF!! YAY we are seeing action! Four other LRA junior commanders have been killed and 98 abductees rescued. Its good to see that things are being done, these scum are being pursued and those abducted are being rescued. This war has been going on FAR TOO LONG and it is now, while action is happening that we must stand strong and UNITE our voices. Spread the word, let the world know that this is happening, that the LRA are STILL currently fighting and abducting, that the Ugandan People’s Defence Force are taking action to end the War. 98 Souls Saved, that is wonderful news to hear, such a great start to the day, after the week i have had of audits at work its a good news day. Lets just hope that the action continues. Through our awareness we are seeing action. STAND STRONG and USE YOUR VOICE. ALSO, Ive recently started sponsoring a Child Headed Household in Uganda. Betty is 16 and has a 3 month old baby of her own. 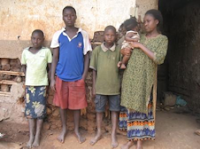 Both parents are deceased and she is the caregiver for her 3 brother siblings (17) (12) & (11). To help me financially be able to support these children i have/am creating a range of items such as shirts, bags, hats, postcards and stickers to help me fund this. 100% of the profits are sent to support the children through a registered non profit “Joy For Children Uganda”. The funds are used to pay for food, kerosine (they live in a no electricity area), school fee’s, medical care and clothing. Their mother passed away in 2004 from AIDs and their father many years before their mother, however the children do not recall when. Since 2004 Betty has been the main provider for her brothers.